Danny Foster was to the 1940s and '50s what Bill Muncey was to the 1960s and '70s and what Chip Hanauer was -- and is -- to the 1980s and '90s. Foster was Unlimited hydroplane racing's first superstar in the years following World War II. Danny's first boat racing contact was with the California Gold Cup class of the 1930s. The Gold Cup Class was a forerunner of the post-war Unlimited Class and prohibited engines larger than 732 cubic inches in piston displacement. In 1938, Foster served as riding mechanic with driver Dan Arena of the Hispano-powered Miss Golden Gate. Foster and Arena finished second in the 1938 APBA Gold Cup race at Detroit. The winner was the Italian, Count Theo Rossi, in Alagi, powered by an Isotta-Fraschini engine. Foster's Unlimited driving career began in 1946. His first appearance behind the wheel of a Thunderboat was at the President's Cup in Washington D.C. with Albin Fallon's Miss Great Lakes. Danny won all three heats and decisively outperformed the favored Guy Lombardo in the Tempo VI. This was the first victory by an Allison-powered boat and the first of many competitive triumphs by Foster, who quickly established himself as the top driver of his day. He was national champion in 1947 with Miss Peps V, owned by the Dossin brothers of Detroit. With this craft, a rebuilt pre-war campaigner, overpowered with an Allison engine, Foster won his first Gold Cup on the extremely rough water of Jamaica Bay outside New York City. Although sponsored by Pepsi Cola, Miss Peps V didn't carry her product's full name into competition because commercial sponsorships were frowned upon. But this situation would soon change. In 1948, Danny made it back-to-back Gold Cups -- this time with Miss Great Lakes at Detroit in a race that is recalled as one of the most destructive in history. Boats crashed, burned, and sank on a day when all that could possibly go wrong seemingly did. Foster was the only entrant out of 22 that could go the full 90-mile distance. Even at that, Miss Great Lakes barely made it back to the pits following the last heat -- before itself sinking at dockside while Foster was receiving the trophy! In the ensuing years, Danny continued to make his presence felt with the likes of Such Crust, Delphine X, Hornet, Gale II, Wha Hoppen Too, and Miss Great Lakes II. To his credit, Foster managed to finish first or second at one time or another with almost every boat that he drove between 1946 and 1955. Foster replaced his friend Lee Schoenith in the cockpit of Gale II during the 1952 campaign. 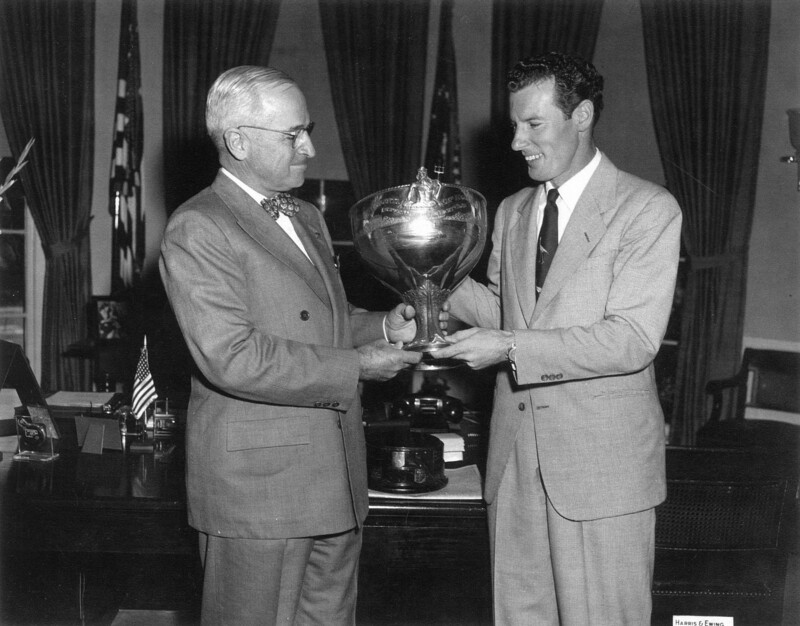 With Schoenith away, serving in Korea, Danny won the Silver Cup on the Detroit River. The following year, Lee was having a difficult day with Gale II at the Silver Cup. After a disappointing third place in Heat One, Schoenith asked Foster to step in as a relief driver. Danny scored a decisive victory in the next heat, beating Bill Cantrell in the Such Crust V and Joe Taggart in Slo-mo-shun V, and put Gale II back into contention. Schoenith then reclaimed the cockpit and went on to win the race. Foster had the kind of season in 1955 that most drivers only dream about. That was the year that he teamed with bandleader Lombardo as pilot of Tempo VII, an Allison-powered craft that the press labeled as "The Sweetest Boat This Side of Heaven." Foster and Lombardo had raced against each other for years; together, with crew chief Roy Duby and under the sponsorship of Decca Records, they were an inspired combination. After being forced out of the 1955 Gold Cup at Seattle due to an on-board fire in the first heat, Tempo VII could thereafter do no wrong. Danny won the Copper Cup at Polson, Montana, the Silver Cup at Detroit, the President's Cup in Washington D.C., the International Cup at Elizabeth City, North Carolina, and the Governor's Cup at Madison, Indiana. The victories did not come easy. Indeed, Foster had to defeat one of the most competitive fleets in Unlimited history that season. Included were Bill Muncey in Miss Thriftway, Chuck Thompson in Miss Pepsi, Jack Bartlow in Miss U.S., Don Wilson in Dora My Sweetie, Cantrell in Gale IV and Schoenith in Gale V.
It is interesting to compare Foster's driving with that of the budding superstar Muncey, who had only just landed his first competitive ride in the Unlimiteds. At Detroit and Washington, the veteran Foster clearly outperformed the rookie Muncey. In the Final Heat of the latter event, Bill appeared en route to an easy win after Danny had spun out in the first turn. But Foster rebounded quickly and took off after the rest of the field. He passed one boat, then another, and caught up with the frontrunning Miss Thriftway. Foster and Tempo VII roared past Muncey as if he were tied to the dock and sprinted on to the checkered flag and victory. After 1955, Foster had few worlds left to conquer. From then on, he was mainly a relief driver or a shore mechanic. Over the next decade, he saw occasional action with Miss U.S. I, Miss Supertest II, Gale VII, and Miss Smirnoff. His last victory was in a secondary race for the Ponderosa Trophy at the 1965 Lake Tahoe World Championship Regatta with the Smirnoff. Long retired from the competitive arena, Danny Foster -- "The Old Pro" -- is remembered as being one of the better among the best in the water sport of kings. One of his more recent honors was his 1994 election to the Unlimited Hydroplane Hall of Fame -- a fitting tribute to one of boat racing's all-time greats.